If you order five (5) videos from any one of our packages then you will receive your sixth (6) video free from that chosen package price. If you order two (2) videos from any one of our packages then you will receive your third (3) video half off from that chosen package price. If you mix your five (5) productions from various combinations of our packages then your sixth (6) video will be free from the highest video package price chosen. 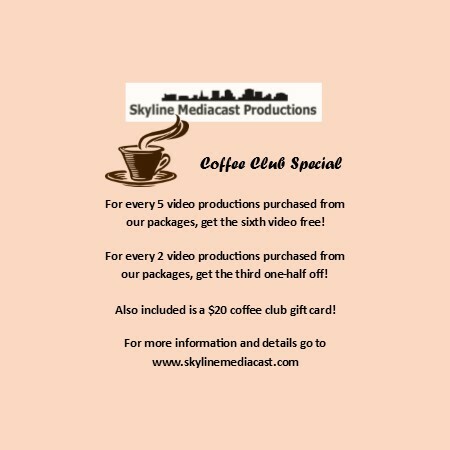 If you mix your two (2) video productions from various combinations of our packages then your third (3) video will be half off from the highest package price chosen. The balance is due upon completion of every single production or combination. The $20 Coffee Club gift card will be given after or when the down payment is received. If full payment is received for the five (5) videos up front then a 10% discount will be deducted from the total. If full payment is received for the two (2) videos up front then a 10% discount will be deducted from the total.